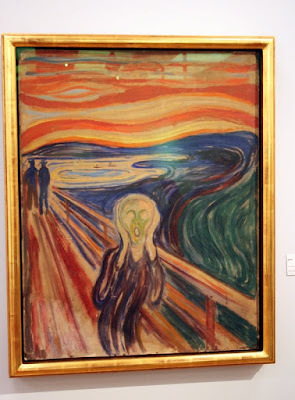 The famous paintings by Edvard Munch (1863-1944); Skrik (The Scream) and Madonna are finally back on the walls in the Munch museum in Oslo. After they were stolen and missing for over 2 years, conservation specialists have worked at restoring the paintings since August 2006. The paintings are now in an exhibition at the Munch Museum, lasting until September 26th. 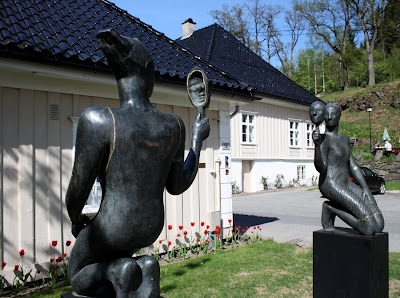 Together with Mark Wilkinson, I went to the Munch Museum a few days ago to see the exhibition of Scream/Madonna and other paintings by Norway's most famous painter. and I began to be afflicted with a sense of melancholy. Suddenly the sky became blood-red. over the blue-black fjord and the city. I stood riveted, trembling with fright. And I felt a loud, unending scream piercing nature. 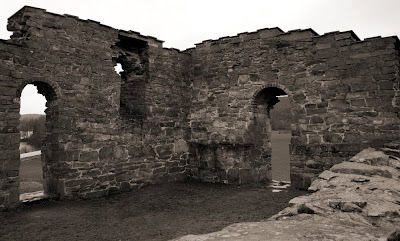 Below Ekebergåsen, where he was walking, there was (and still is) a mental asylum. He might have heard one of the patients scream, but that is just a guess. 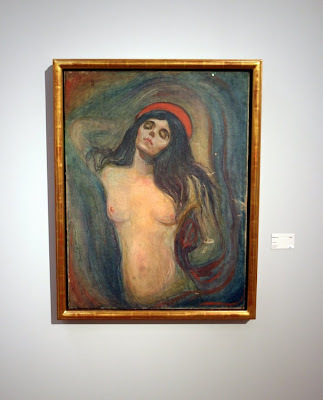 Munch's paintings were also to have life, to feel and to suffer. He would paint outdoors at all times of the year at his home in Ekely, in an outdoor studio. Finished paintings were hung on the walls there and left out unprotected. He said his paintings could only improve by that sort of treatment. Oh well, that will be all right when it has stood there for a while and has had time to mature. 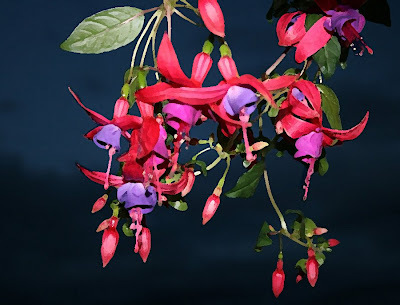 The colours live a remarkable life of their own after they have been applied to the canvas. Some reconcile themselves to one another, others just clash, and then they go together either to per­dition or to eternal life. Just wait until they have weathered a few showers of rain, a few scratches with nails, or something of the sort, and have knocked about all over the world in every kind of miserable, battered, and far from air- or water-tight packing case. Oh yes, that will turn out all right ... when it has developed a few slight flaws it will be quite presentable. I think, therefore, that any sentiment regarding the damage done to the stolen paintings is quite unfounded. In some ways I think Munch would have been happy that the paintings have now had an added injection of life. 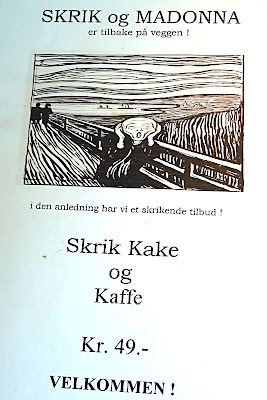 Seen at the café at the Munch museum: "Scream and Madonna are back on the wall." 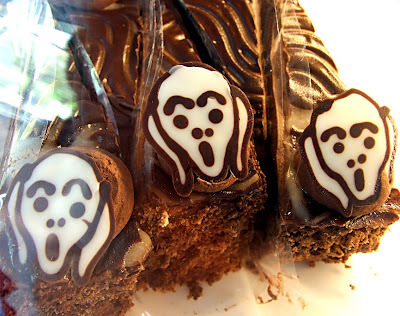 To celebrate this you can now buy a chocolate cake with Scream decoration. Looks yummy, doesn't it?! This weekend I went on a ferry trip to Denmark. 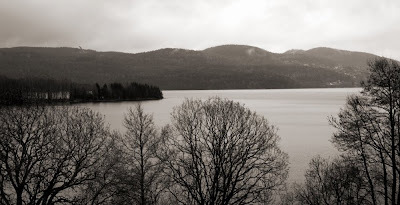 This is a photo from returning to Oslo. We had some really nice weather, as you can see. 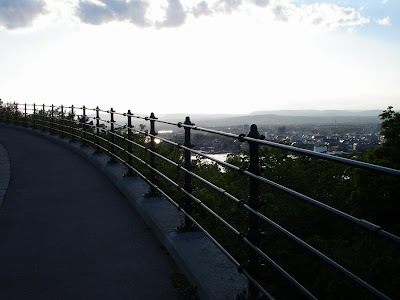 You can see Akershus festning (Akershus Fortress) and parts of Oslo in the background. 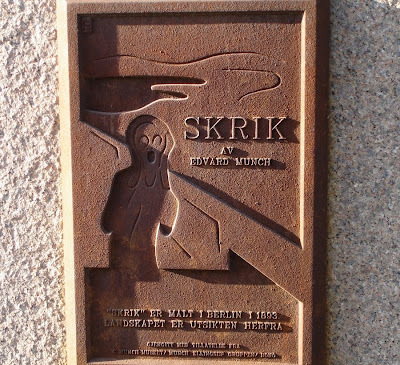 This is the location at Ekebergåsen where Edvard Munch was inspired to paint The Scream. 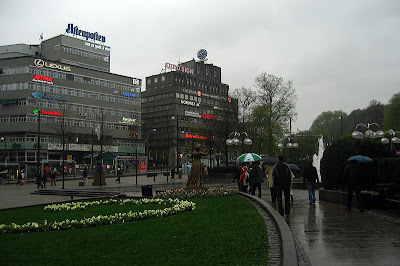 This is a view over parts of Oslo center. The picture was taken from east; at Ekebergåsen. The large white building by the fjord is the new opera house. 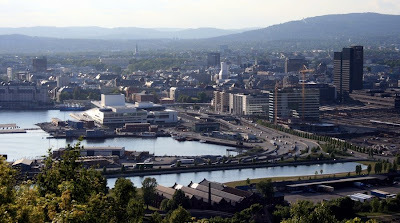 You can also see the Oslo Central Station to the right, and the water in the foreground is the Oslo Medieval Park. I really love these sculptures, but unfortunately I don't know the name of the artist. Still, I hope you'll enjoy this photo from Bærums verk. 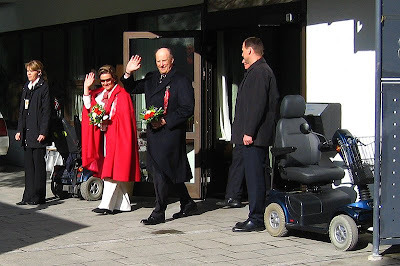 A while back I went to Bærums verk with my family. It used to be an iron work, but now it's a place for arts and crafts, restaurants and exhibitions. 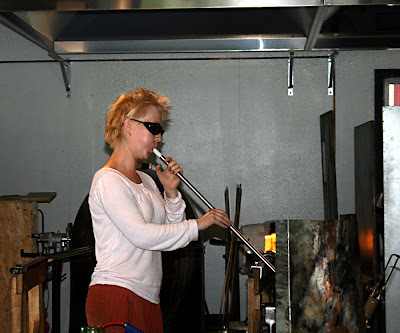 While there, we saw some glassblowers in action and I took these photos of one of them. It must be really hard and warm work! In the shop next door you can buy some of the glass art they're making, but unfortunately it was closed the day we were there. 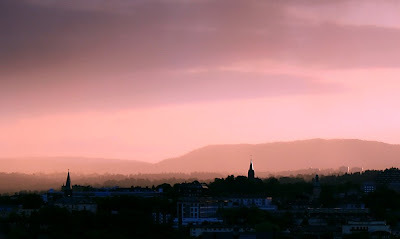 Oslo, May 17th at sunset. From Oslo airport, Gardermoen around midsummer 2006. Thanks to Mark Wilkinson for letting us use his photo! It was a cold and snowy morning (actually the coldest May 17th we had for 50 years! ), and the local children's parade hurried through their route. I have never seen a children's parade moving so fast before! ;o) I felt sorry for them in the snow! 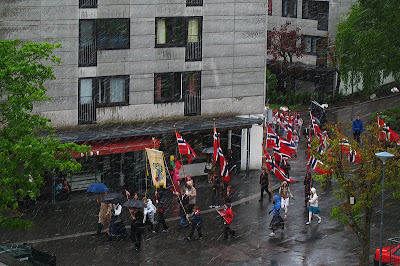 Today is May 17th, the Norwegian Constitution Day which you can read about here. 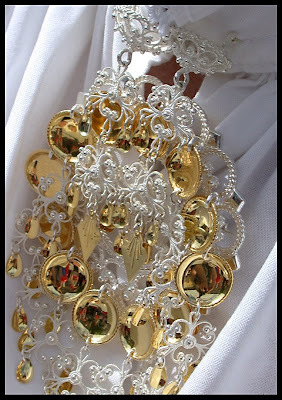 The photo is of a Norwegian brooch used on National costumes; "bunad". You can even see the reflection from the celebration going on nearby. Today is Stormel's birthday. Happy birthday, dear friend and neighbour! Thank you for all your wonderful contributions to this blog, it certainly wouldn't be the same without you. 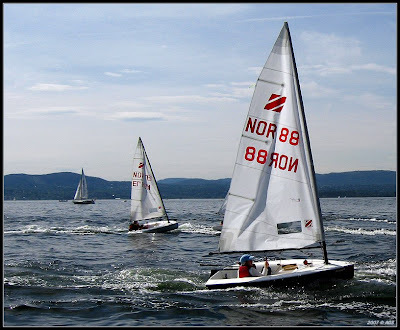 Maridalsvannet is Oslo's largest lake with an area of 3,83 km². 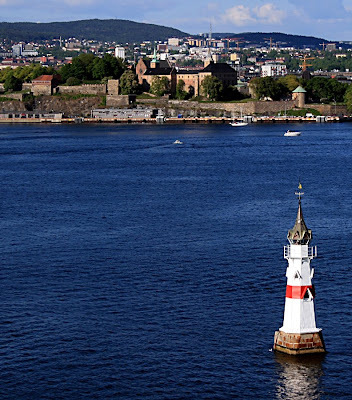 It is Oslo's main source of drinking water. 80 % of the city's inhabitants get their drinking water from here. 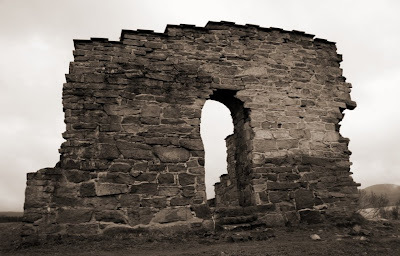 Near Maridalsvannet is the old church ruin I've showed you on the blog earlier. 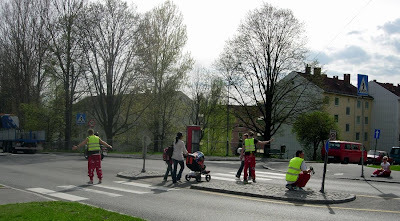 The 18-19 year olds who graduate upper secondary school, have their own special celebration that goes on for a few weeks in May. They dress in overalls, mostly red or blue (depending on what school they go to) and do strange or funny things. 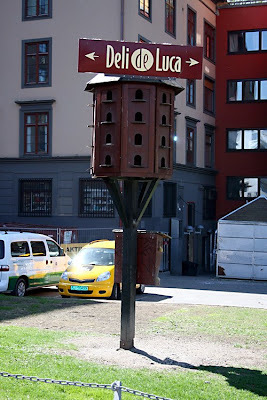 (They also party outside during the night, playing very loud music.) You can read more about this Norwegian tradition in English at Wikipedia. 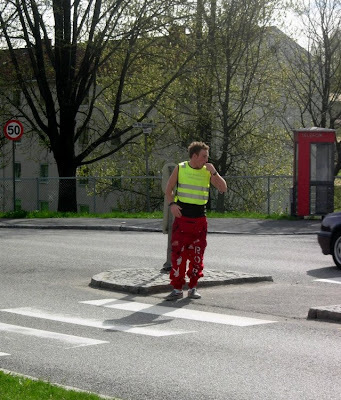 My sister "Imzadi" took these photos of some red "russ" who were pretending to be traffic police. They'd brought hair dryers to make it look like they had radar speed checks, and whistles that they were blowing while stopping the traffic to let pedestrians cross the road. I love this time of year! We have lovely weather, it's as warm as it usually is in the summer and in just a few days, nature has become green. 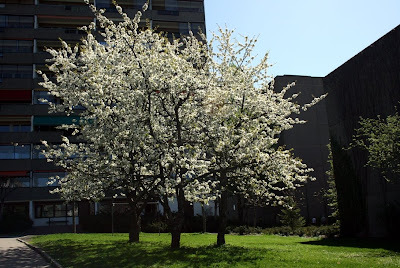 I love these trees that are blooming now. I think they're called "Hegg" (Hagberry?). 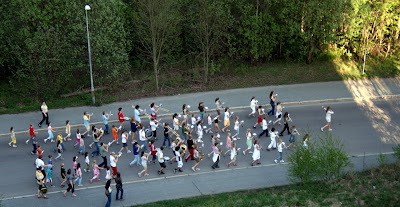 May is the month when all the school bands come out to practice marching and playing. They want to be all ready for May 17th. As yesterday is the date when WWII ended in Norway, it was marked by a couple of bands playing for a nursing home near where I live. This band actually played quite well. 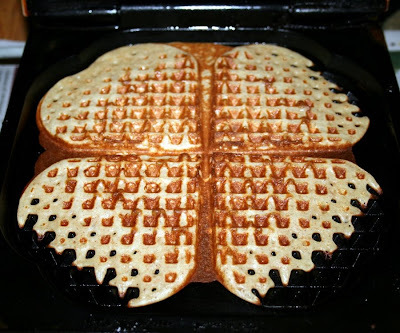 A big favourite dessert in Norway is "vafler" (waffles). In the month of May we have many bank holidays and we will soon be celebrating our national day on May 17th. What a perfect time to make "vafler"! I've made vafler since I was a kid, so I don't really use a recipe. 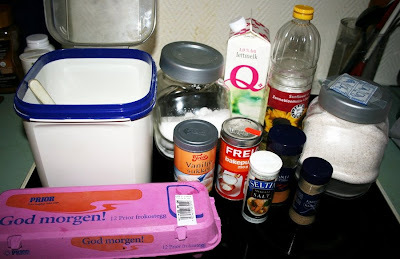 I just take whatever I've got (well, nearly...) and when we decided to have vafler the other day, this is what I had: Eggs, sugar, flours, oil, milk and some spices. I also add baking powder and some vanilla sugar. After another search I found some sour cream and cream as well. Good! 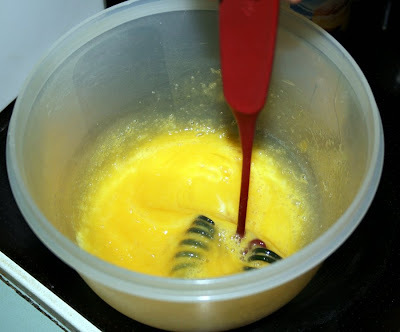 I start off by stirring eggs and sugar. Then I just add the different ingredients and stir until the batter is a bit thicker than pancake batter. You can eat it with different kinds of jam, sour cream and jam, sweet brown cheese or just butter. 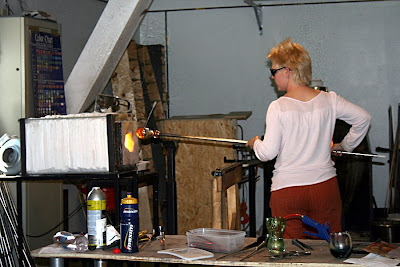 I'm sure, if you ask Norwegians how they make vafler, you'll get very different opinions about it. The more "good stuff" you add to it (like cream, sour cream, curdled milk), the better they get. When you buy bottled water, soda pops, lemonades or other beverages, you can bring the empty bottles/cans back to the shop to deposit them and get money. 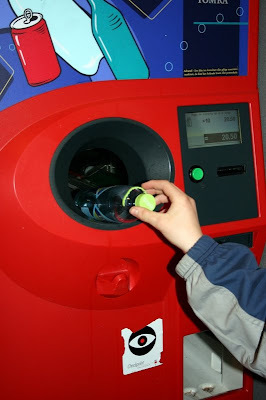 Each shop, kiosk, petrol station (usually) have a machine where you put your bottles, one by one, and when you're done you push a button to get the receipt for how much the shop have to pay you. You then bring the receipt to the cash register and they'll withdraw the amount on what you're buying. If you don't buy anything, you'll just get paid the amount for the bottles. 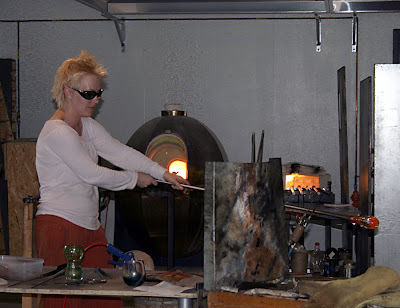 Metal cans are melted and recycled. The plastic and glass bottles are sanitized and then recycled. Since 1999, Norsk Resirk has made Norway a global leader when it comes to depositing and recycling non-refillable plastic bottles and beverage cans. 82 per cent of plastic bottles are returned, while the figure for cans is 92 per cent. All deposited containers are recycled. The 265 million cans deposited in 2007 provided 4400 metric tonnes of aluminum for new cans, while 77 million bottles provided 3200 metric tonnes of plastic for new plastic products. In my building there is a secondhand/antique-store. 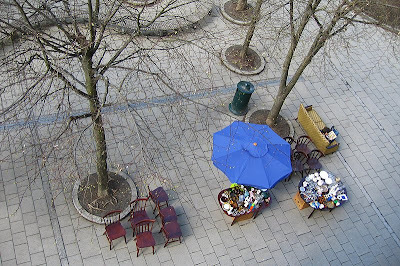 On sunny days, like yesterday, they bring a lot of their stuff outside. 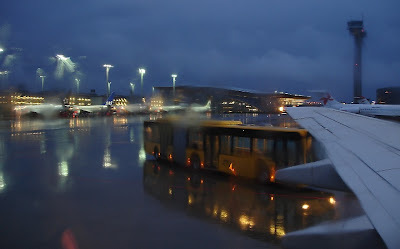 Thursday was a rainy day in Oslo. The Margareta Church in Maridalen, a farmland and forest area north of the city. 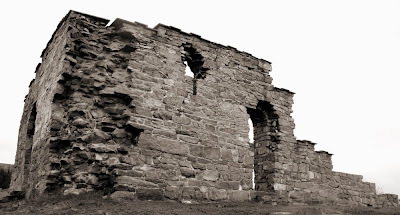 This old church was built in approximately year 1250. It's named after Saint Margaret of Scotland.